SPRING RACING There are 47 products. 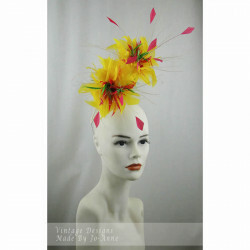 Yellow, fuchsia and lime green biot feather "Explosion" headpiece. Braid covered bandeau wire frame, will suit most head sizes. 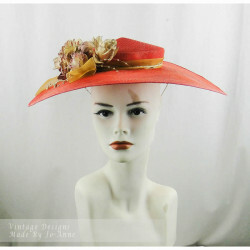 Hand painted shallow crown, droopy brim hat in varigated red and yellow tones, with gold floral motif and ribbon trim. 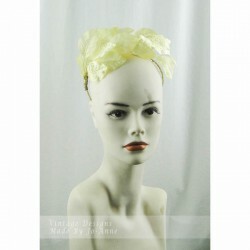 On a bandeau headband, will suit most head sizes. 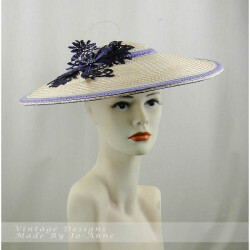 Shallow midi crown, light coloured natural straw and swiss braid drooped brim headpiece, trimmed with braid shades of lilac, lavender and pale green. With beaded aubergine lace motif and natural quill. On a bandeau wire will suit most head sizes. 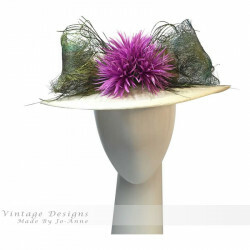 Gorgeous Vintage Navy Straw Hat with rolled Brim edge. 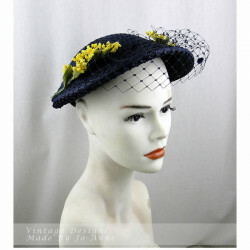 Hand Fashioned Wattle Trim and Navy Veiling. Worn at the back of the head. Will suit most head sizes. 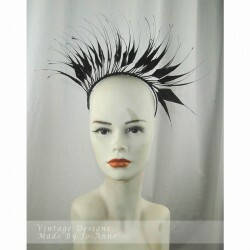 Sculptured Feather Headpiece in Black On a hand band, will suit all head sizes. 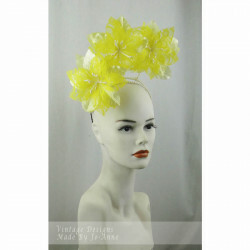 Hand dyed, soft yellow leaf headpiece. On a headband will suit most head sizes. 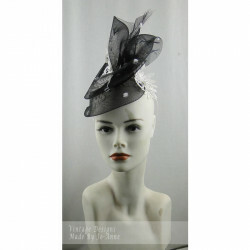 Black and White Chenille Spot Crinoline Headpiece with White Lace Motifs. On a headband will suit most head sizes. 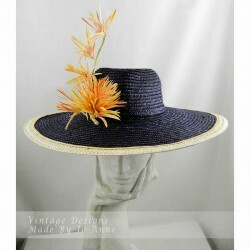 Navy Straw Braid Cartwheel Hat with Starbright Braid Edging and Hand Painted Biot Feather Trim on Braided Quill. Will suit an average head size. 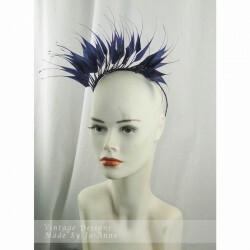 Sculptured Feather Headpiece in Navy Blue. 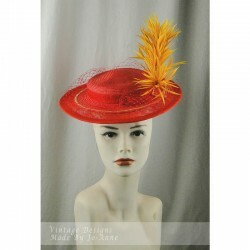 On a hand band, will suit all head sizes.